Maintain Cleaner, Safer Air in Your Commercial Workshop with a Quality Portable Fume & Dust Collector Unit. 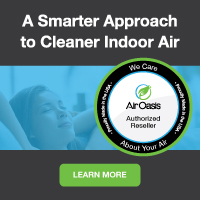 Here We Offer The Best Source-Capture Industrial Air Purifier Value You Can Buy, with a Quality HEPA & Carbon Filter Scrubber System That Remove Chemical Gas, Vapor & VOC Pollution, Eliminates Smoke & Extracts Toxic Fine Particles from Welding, Soldering, Plastics Extrusion, Laser Engraving, Ceramics, Woodworking Rooms, Construction Sites & More--All at A Discount Price with Free Shipping! Commercial source-capture purifier with best quality filter scrubbers collect & remove chemical gas, vapor, smoke & particles for cleaner workshops. AER Portable Fume Collector Series can house a Cartridge, Fiberglass, HEPA, or Carbon filters for dust, fume, smoke, as well as odor or vapor. 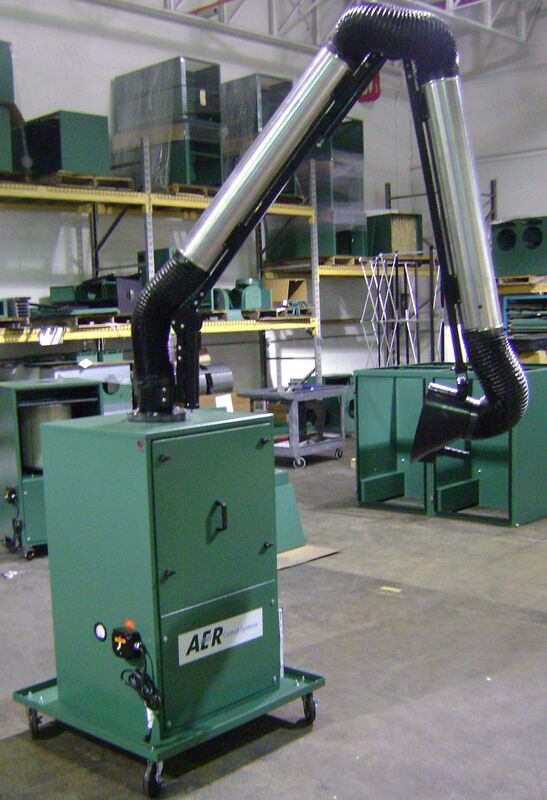 AER Control System's made in USA Portable Fume Collectors (PFC) are designed to provide efficient, cost effective control dust, fume, smoke and odor contaminants generated from a variety of manufacturing and process applications. Typically used for control of moderate concentrations of dry contaminants, the PFC series can be used on a variety of processes that generate dust, fume, smoke or odor. The PFC series unit is designed for a low cost alternative using filters that are designed to be thrown away rather then cleaned with a built in cleaning system. The cartridge unit can be cleaned via a industrial shop vacuum rather then disposing the filter. The Portable Fume Collector will help with compliance to local OSHA regulations by drawing contaminants away from the operator’s breathing zone and reduce emissions to an acceptable level. The PFC Series Collector comes standard with a first stage of metal mesh filter and second stage is either an 164 square feet of 80/20 polyester blend cartridge or a washable spun bond cartridge of 90 square feet of filter area with an efficiency rating of 99% at 0.5 microns. Also standard is a single phase 1 HP TEFC motor with non-overloading direct drive blower, tool-less filter access door. Other filters can be used instead of the cartridge such as a fiberglass/ HEPA combination or a HEPA/ Carbon combination depending on the type of contaminant. If smoke is present an additional 99.97% at 0.3 micron HEPA cabinet can be added. • Multiple filter cartridge configurations available to match virtually any application. • Standard 6” Diameter x 7’ Extraction Arm, 10' Arm Available. • Heavy duty steel construction with Kelly Green industrial textured powder coat finish. • Mini-helic filter change-out guage. AER Control Systems AER Portable Fume Collectors (PFC) are designed to provide efficient, cost-effective control for dust, fume, smoke and odor contaminants generated from a variety of manufacturing and process applications. Typically used for control of moderate concentrations of dry contaminants, the PFC series can be used on a variety of processes that generate dust, fume, smoke or odor. The PFC series unit is designed as a low-cost alternative to units that use throw-away filters. The PFC's particle or cartridge filters can be cleaned with an industrial shop vacuum rather than having to dispose of the filter until much later than normal--a big cost savings for many businesses. This unit will help with compliance of local OSHA regulations by drawing contaminants away from the operator’s breathing zone and reducing emissions to an acceptable level. The PFC Series Collector comes standard with a first stage of metal mesh filter and a second stage of either 190 square feet of 80/20 polyester blend flame retardant cartridge or 95 square feet of washable spun bond cartridge with an efficiency rating of 99% at 0.5 microns. Also standard is a single phase 1 HP 1000 CFM TEFC motor with a non-overloading direct drive blower, and a tool-less filter access door. Other filters may be used instead of the cartridge, such as a fiberglass/HEPA combination or a HEPA/Carbon combination, depending on the type of contaminant. If odor or fumes are present, this unit is available with 90 lbs of high-quality industrial activated carbon, with refillable cells. If smoke is present, an additional 99.97% efficient 0.3 micron HEPA cabinet can be added. Whatever airborne pollutant you need to remove in your room, shop or production line, the PFC is your best, completely customize-able dust and fume extractor option. And here at our online store, we make it easy for you to get the best commercial and industrial fume extractors at discount prices with free shipping due to our extremely low overhead. Call us today for a free consultation at 1-800-701-2513. We are here to help! Add 40 lb Carbon Module for Fume/Odor? Explosion Proof Motor (NEMA 7/9 XP)? XP Explosion Proof Wiring Package?